Grime is an energy, and the icy synths, raging bass and braggadocios bars are the elements that compel you to screwface as a sign of appreciation. It's the way the MCs battle for the mic to generate the most chaos from a crowd—it's that Who's got a Nokia? Take that what! attitude. You're in the midst of a grime renaissance—can you feel the sweat dripping down your neck? That lingering smell of clammy adolescents with a forgetful fear of deodorant? If not, then you're probably in the wrong place and may as well be watching a Coldplay gig. 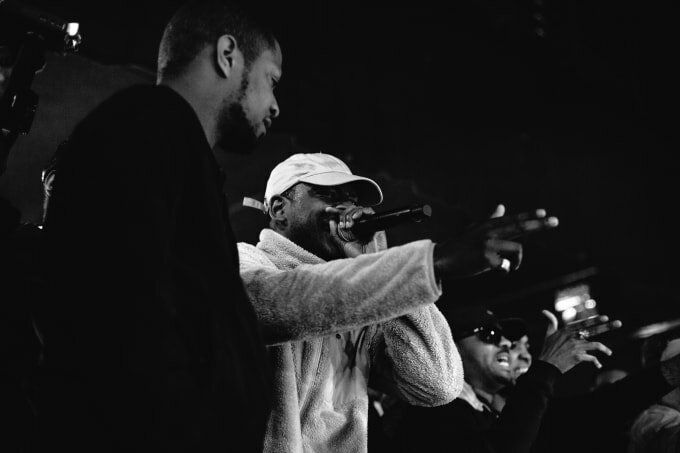 Eskimo Dance, one of the biggest and most iconic grime events, has been on a tour of the UK's major cities this year—with our highlight being London's March 5 stop, where they delivered the sound to the masses one reload at a time. Since the alleged signing of Drake to BBK—and that globally-reported appearance at a Section Boyz show—most London club nights that play only a sprinkling of grime have been jam-packed (and even shut down) with the excitement of a potential Aubrey arrival. Eski freezed up that hype and left it outside for the foxes, with no 'take care' notes in sight. Fans were there to witness President T shell and welcome back Solo 45 with a flying gun-finger. It was also refreshing to see a room full of just-turned-18-year-olds step out from behind their computers and experience grime IRL, live in the flesh. Here are some of our favourite moments from the March 5 event held at Building Six.